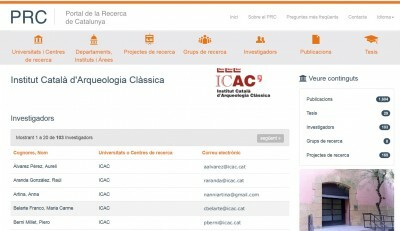 We invite you to visit the new update of the Portal de la Recerca, PRC (Catalan web portal for research), which aims to display and disseminate from a single place the research activity that is carried out in Catalonia in regard to researchers, publications, groups and research projects. Thus, facilitating open access to scientific production. Currently, there are 21 institutions and almost 12,000 researchers participating in the PRC portal. In the last data update (March 2019), the ICAC has been able to provide a more realistic number of scientific production included in the application. The PRC establishes a calendar of annual charges. For this year it has scheduled 6 loads, the next one for the month of May. One of the most outstanding features of the Portal is the new abbreviated CV submission system that, through an automated data upload, allows you to attach it to the research evaluation requests.